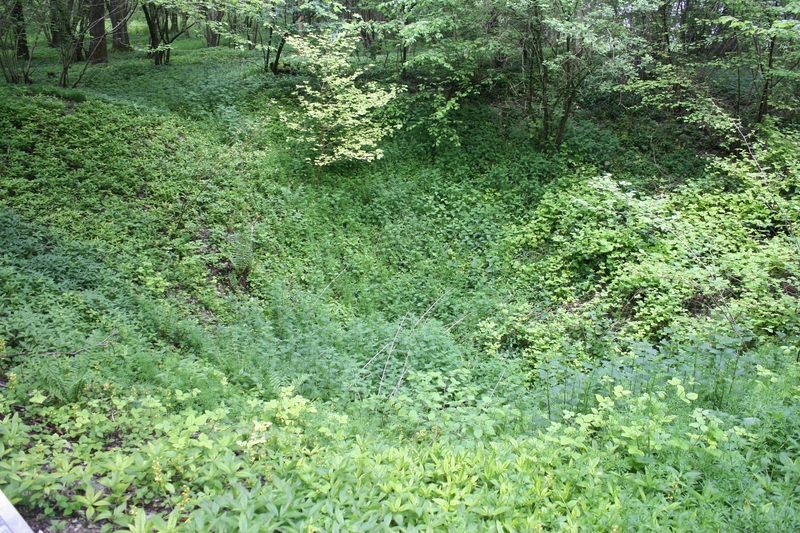 This is the view that the men of the 36th (Ulster) Division would have had on the morning of 1st July 1916, as they left their trenches on the edge of Thiepval Wood and advanced towards the German lines on the crest of the rise, and the formidable Schwaben Redoubt beyond. Looking east, the road leads to the little village of Thiepval in the distance, with the Thiepval Memorial on the horizon to the right. 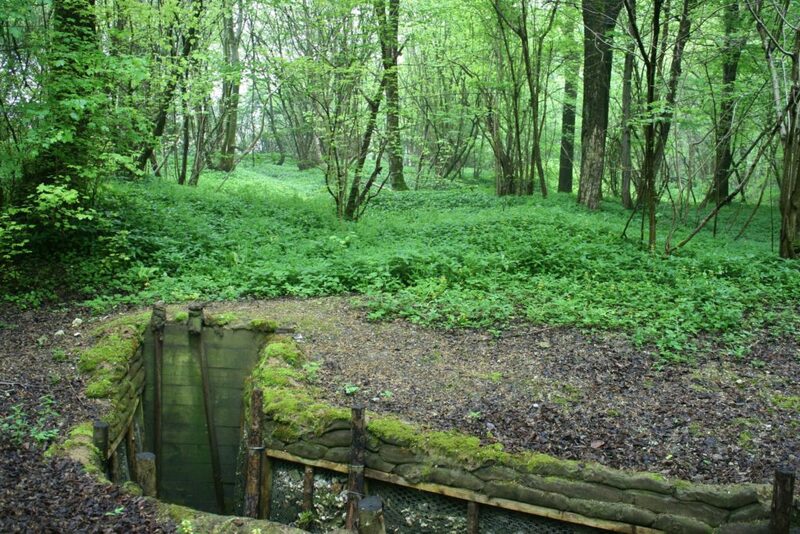 This was No Man’s Land on 1st July 1916. Imagine thousands of men tramping from right to left across these featureless fields, with no cover and, many of them probably thought, little hope, man after man falling as German machine guns and artillery cut them down. 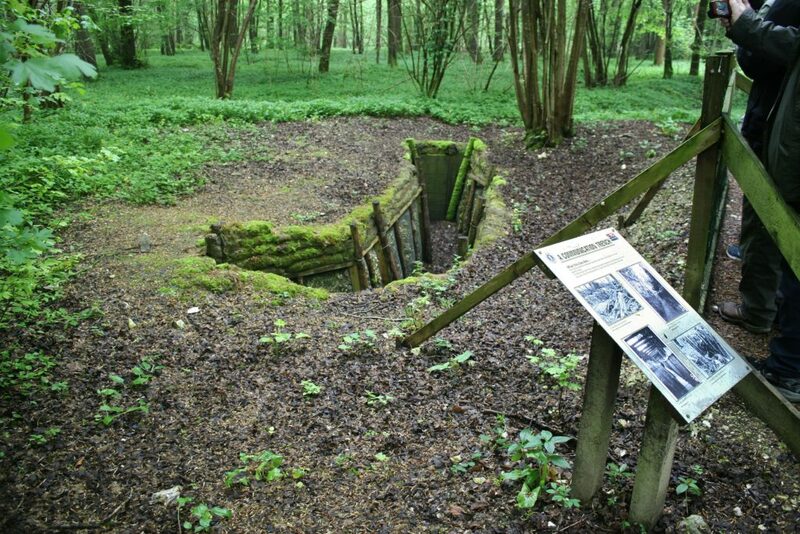 And yet the Ulstermen who advanced here managed to push on as far as anywhere along the British front on that terrible morning, before the inevitable retirement transpired. Brave men. 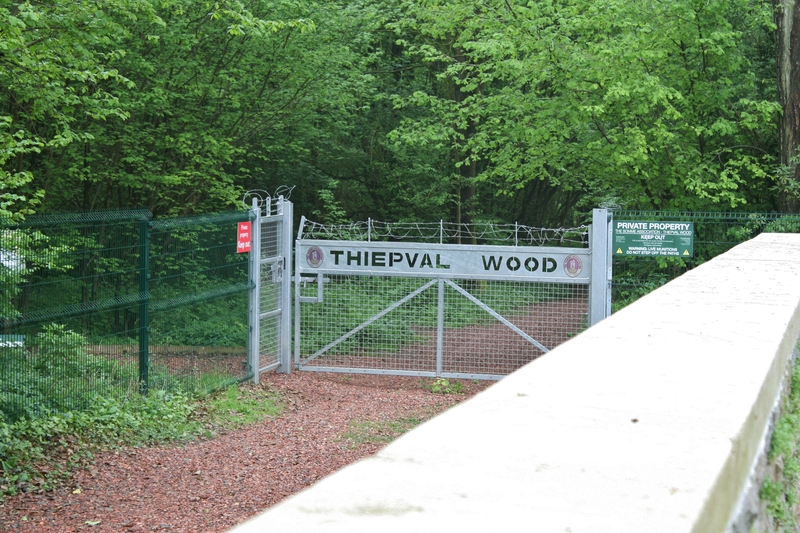 …which leads us to the entrance to Thiepval Wood. 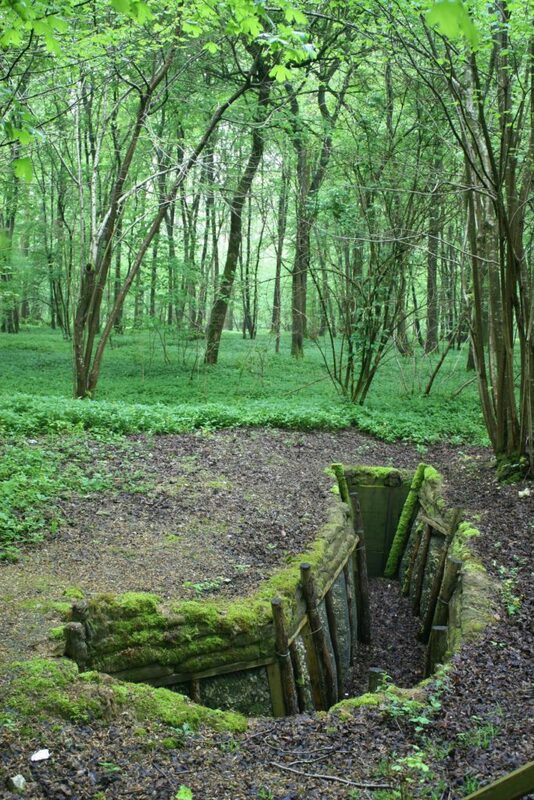 I’ve always wanted to visit these woods, whose names have become synonymous with the fighting during the five and a half months of the Battle of the Somme, and in the last year and a half I’ve at long last had the opportunity to spend some time in more than one of them. 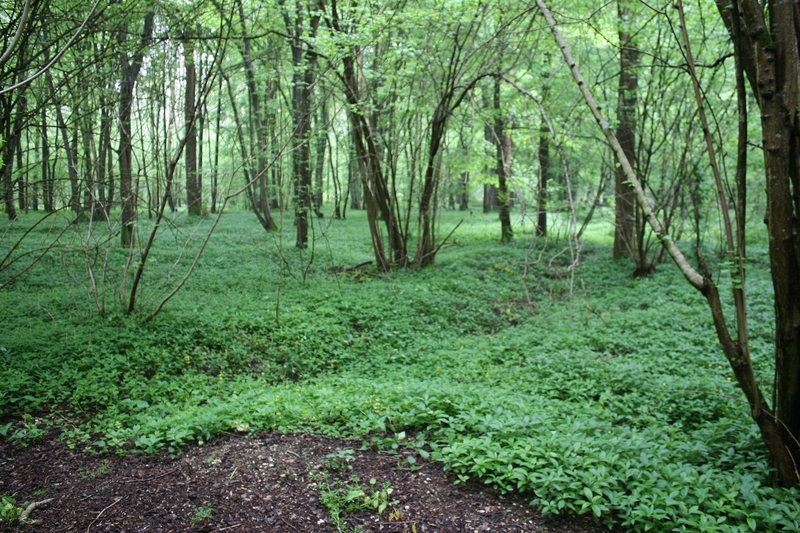 Thiepval Wood, or the Bois d’Authuille, as it is known locally, has always been high on the list; apart from for hunting purposes and tree felling, it has remained virtually untouched for a hundred years. Thanks to the Somme Association, who now own the wood, it is possible, by arrangement, to have a look at the trench excavations within it that have taken place in recent years. 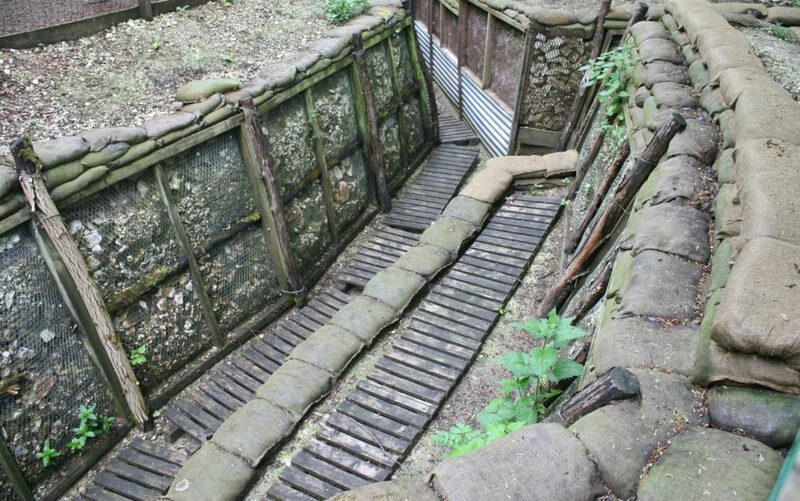 There are plenty of photos and not a lot of annotation in this post, as photos of trenches are photos of trenches unless you expect me to start eulogising about parapets, paradoses and A-frames, none of which I have any intention of doing. Ha! 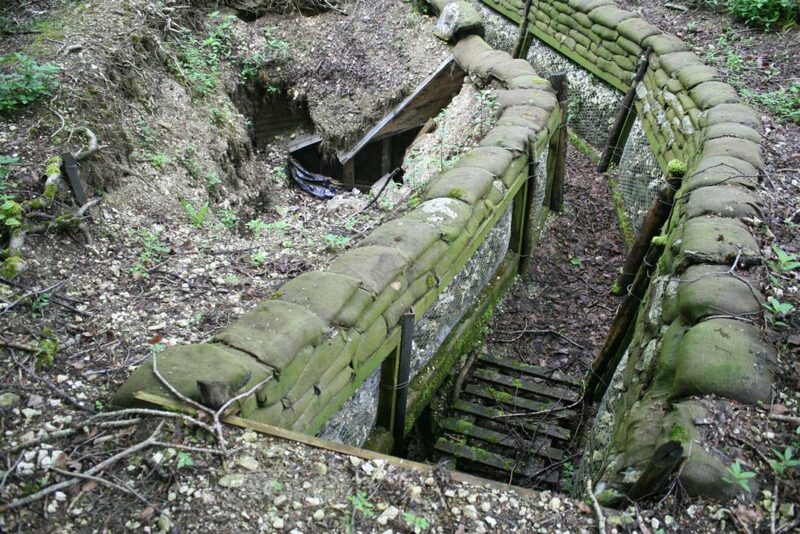 The 36th (Ulster ) Division arrived on the Somme in the winter of 1915 and by mid-March 1916 were installed the front line trenches between Beaumont Hamel and Thiepval, taking over from the Scottish regiments who had held this sector of the line before them. At the time, the wood contained not only trenches with names such as Elgin Avenue and Ross Castle, but also ones from the French tenure of this sector earlier in the war. Teddy Colligan, who came here some fifteen years ago and never went home, holds court (he’s the man you need to contact if you fancy a look in the wood yourself). This is a section of Whitchurch Street, occupied by the Royal Inniskilling Fusiliers on 1st July 1916. 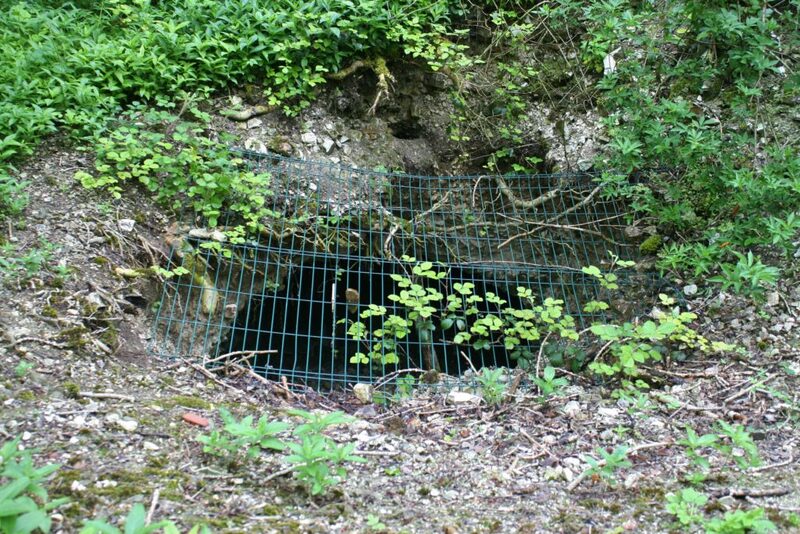 The small sap on the right hand side of this picture (and at the top of the previous shot) was originally dug to hold gas containers which, in the event, were never used. 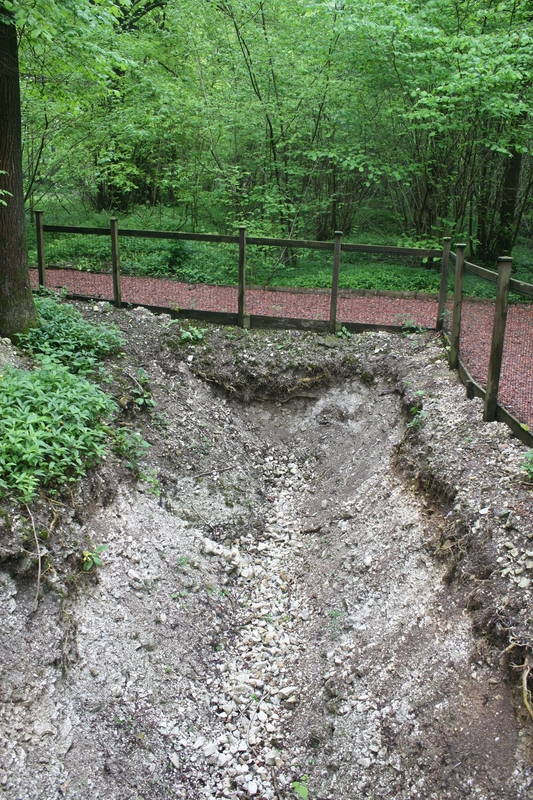 Two were still here in 2007 when the trench was first excavated. 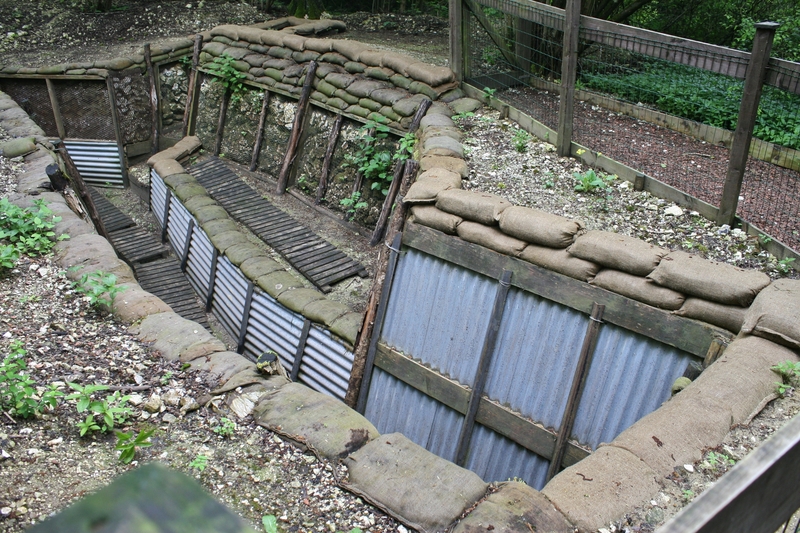 According to Teddy, the trenches have been restored using as much of the original material that was uncovered as possible. 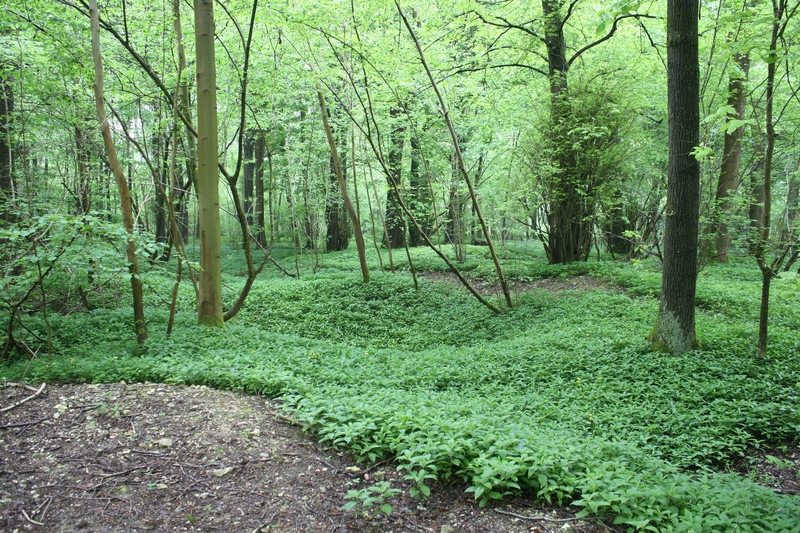 Never forget that this wood is a mass grave; hundreds of missing men lie beneath the green blanket that now covers this still cratered, yet peaceful, woodland floor. Communication trench (above & below). Numerous communication trenches once wound their way south through the wood towards the British rear area. Indeed it is! There are a number of information panels along the route. 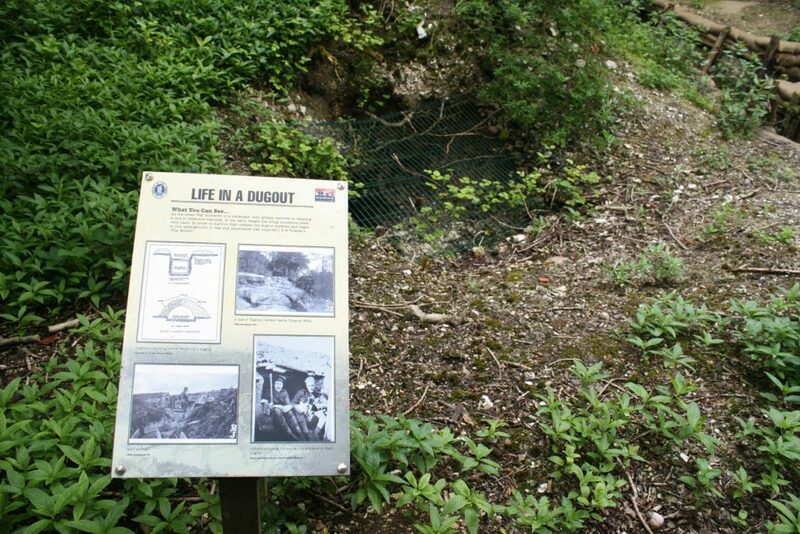 …with a dugout entrance leading to who knows where (above & below). …and old dugouts still litter the floor of the wood. 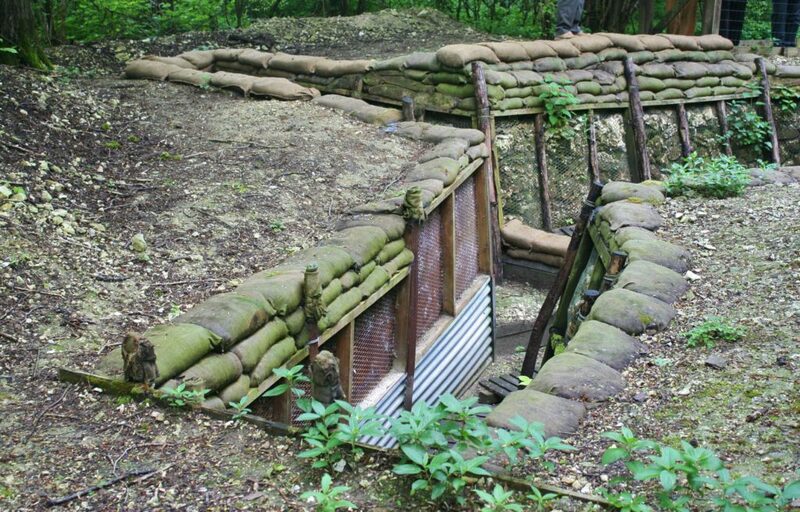 Some of these dugouts date back to the French occupancy of the wood in 1915, suggesting that, whatever you may have read about French trenches from early in the war, their constructions were pretty strong, and the British continued to use them. 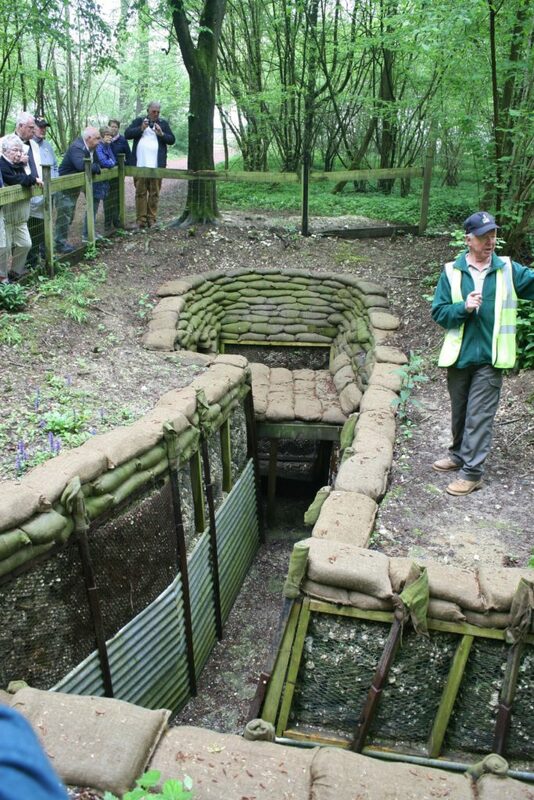 …shows clearly its meandering structure, designed to reduce blast injuries should the trench receive a direct hit, as it snakes its way south. Elsewhere, excavations continue. This photo is actually more interesting than you realise. We shall return to this shortly. 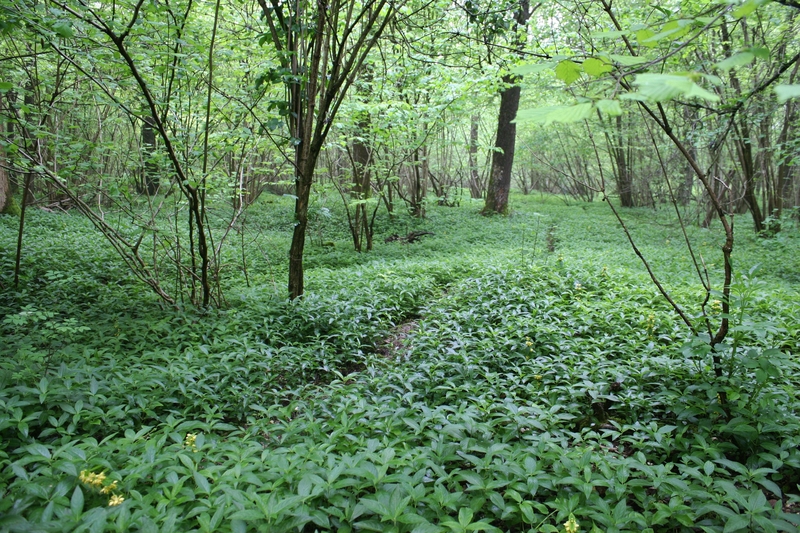 …and you’ll soon find yourself surrounded by the swampy marshland of the Ancre valley. Teddy explains the lie of the land. He knows his stuff. The sandbagged crescent area at the far end of this trench was once an emplacement for a trench mortar. 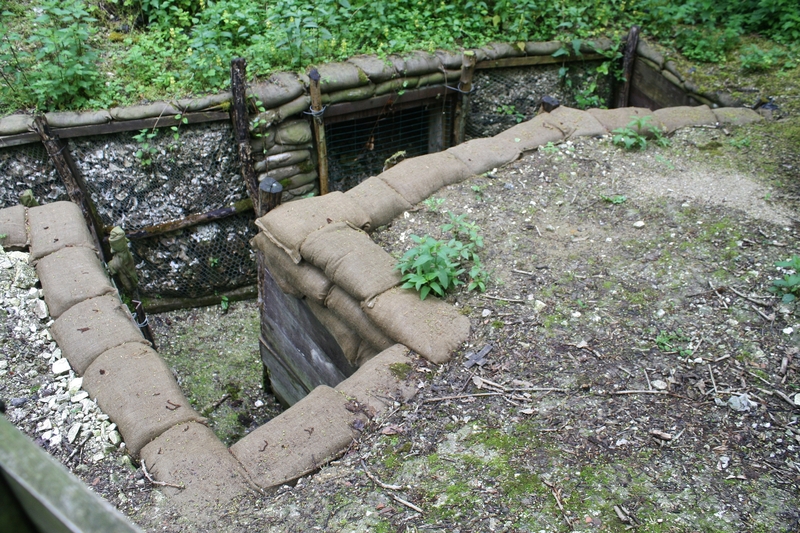 Fired by a lanyard, the mortar men would hide round this ninety degree angle to protect themselves from the blast. …and this is what I found. 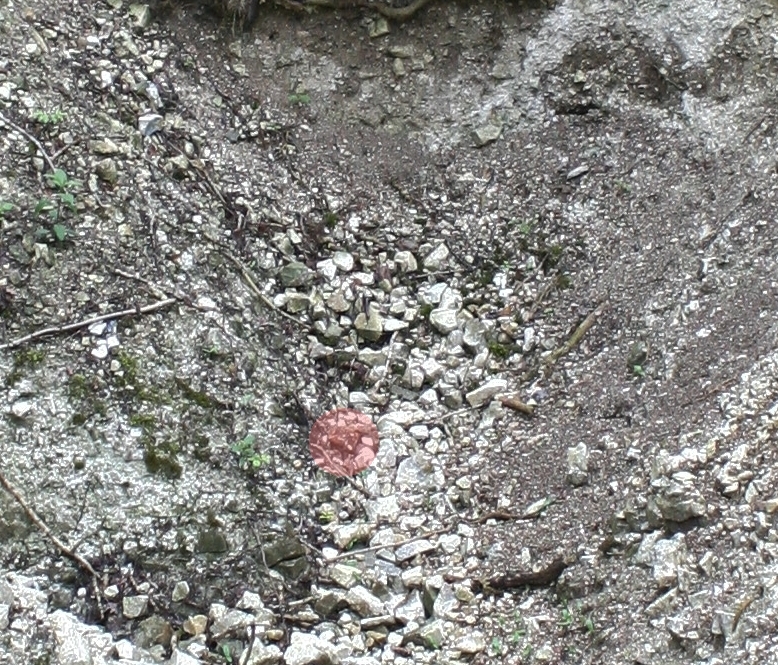 Look very carefully at this close-up of the excavation trench we saw earlier. Anything? 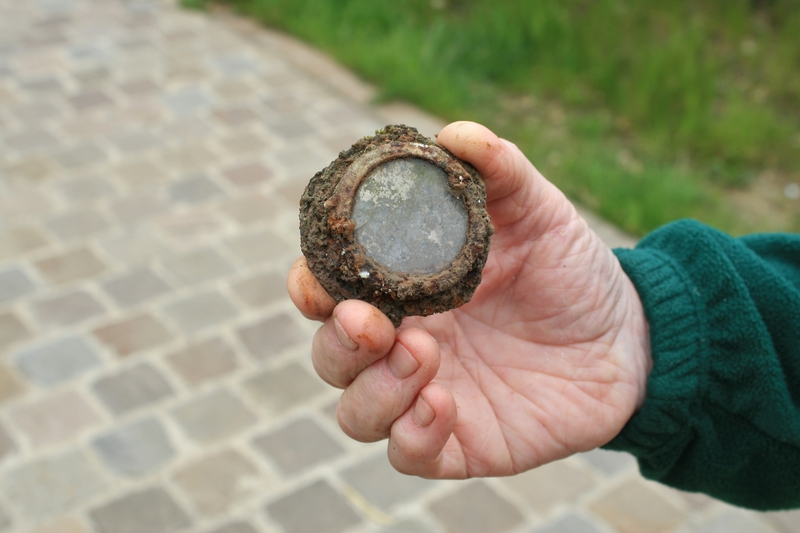 …turned out to be an eyepiece from a British gas mask, lens intact. Teddy was one happy man when we pointed it out to him. 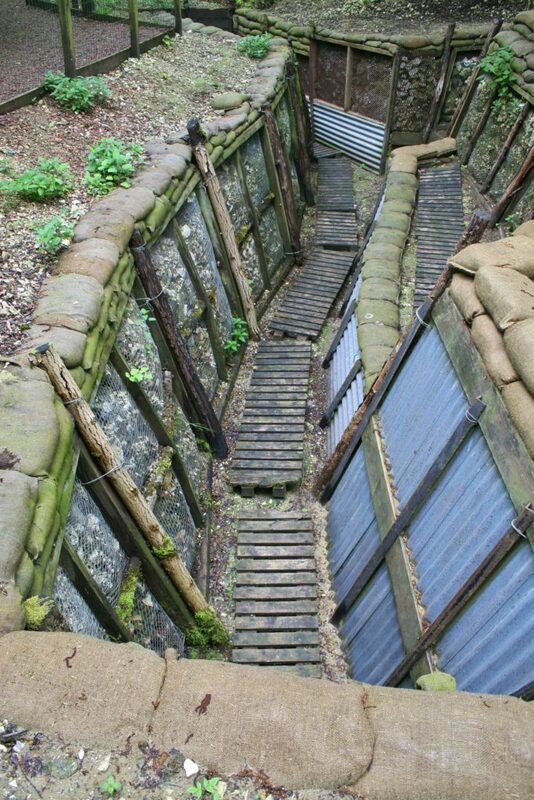 You can now see it at the Ulster Memorial Tower museum, I expect. I said it before and I’ll say it again. Nice job Pauline. 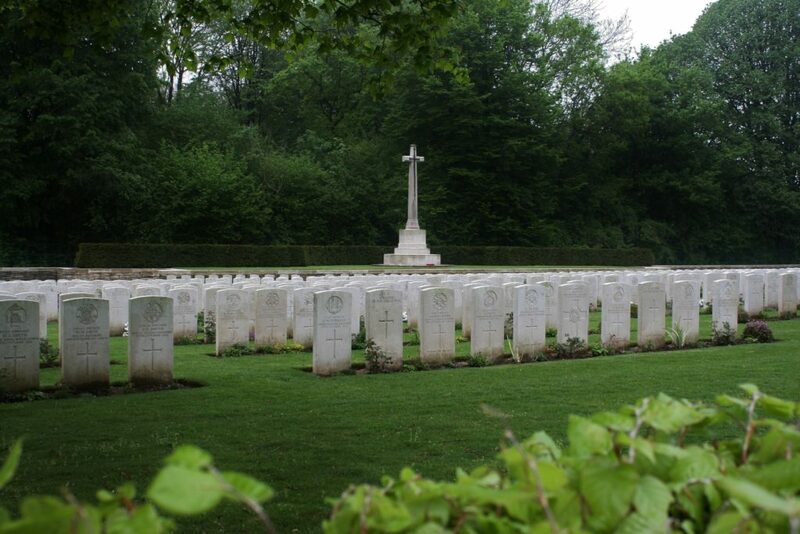 Let’s take a look around Connaught Cemetery next. 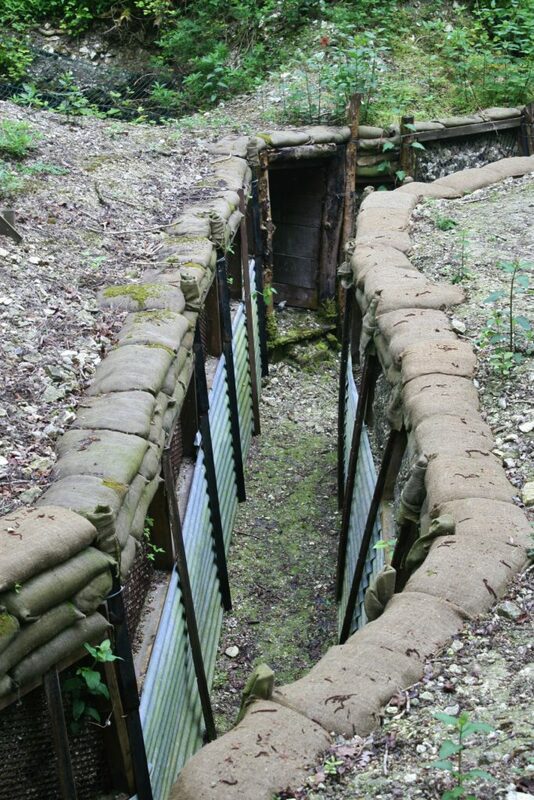 This entry was posted in The Somme, Thiepval. Bookmark the permalink. Beautiful pictures, it’s hard to think so much misery and destruction happened there. Thanks for posting this! Thanks Mrs B. You’d have found it most interesting. And yes, it’s all so peaceful now. But it wasn’t once. Wish I had discovered that on my recent trip. Great, informative article again though. Part of me wishes we’d kept it! But a lot more people will get to see it this way. I really don’t know what to say MJS – I even waited several hours before commenting but still do not have words to adequately describe what is another wonderful post. Sid, my friend, really glad you enjoyed this one! 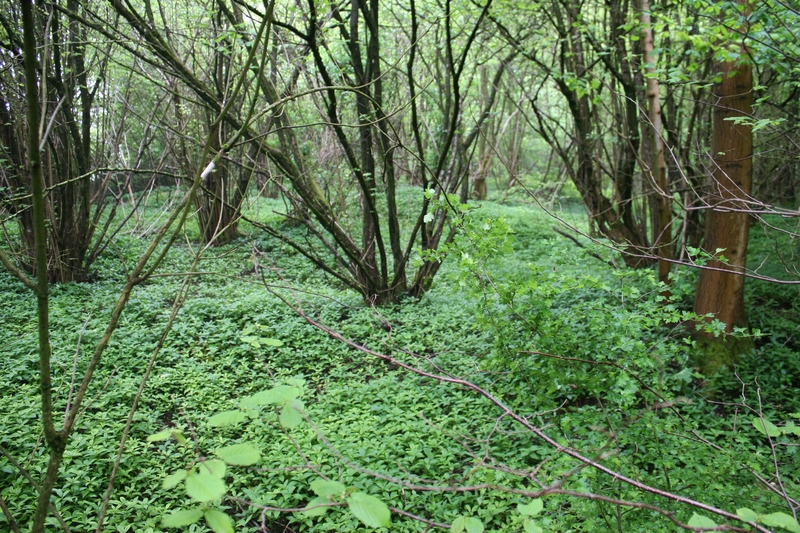 It was a real treat to be shown round the wood. And nice to be able to show you all what it’s like. 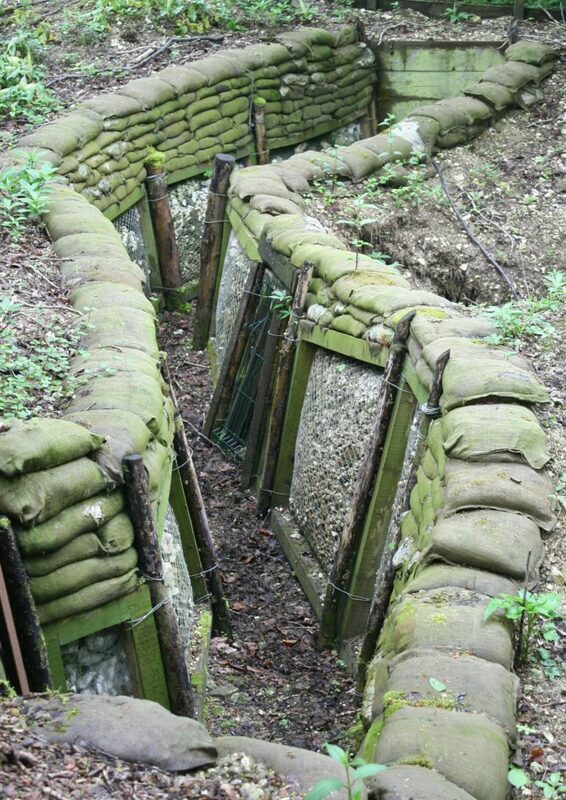 Mind you, there are many photos in books of far less habitable trenches than these that I’ve seen over the years!! Fantastic photographs and commentary – thanks for sharing these. Thank you Mark. Most kind. Keep viewing!! The Misey is not withe with dead .A tremendous waste of lives the real misery is with the wounded the disabled the wife’s mothers sons of the dead. All the women folks received was a telegram saying their kin was dead, their allowances were stopped and they were left to cope on their own . They are the real heroes . There in nothing worse than a battle lost than a battle won. Pte. E.J. Neale, of theRoyal West Surrey’s (Queen’s) who is in an Oxford hospital, suffering from wounds received in France, has written to Mr. G. Horden, of High Street, Kettering. 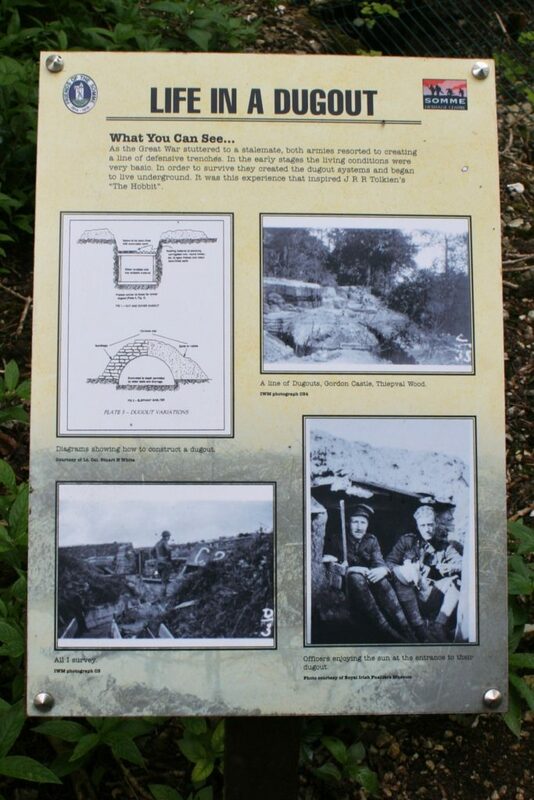 Amongst other items of information are the following :- “You did not know that I was in the Machine Gun Section. It is a hot job if they got to know whereabouts you are. The machine gun went out of action about a quarter of an hour before I got hit in the elbow. 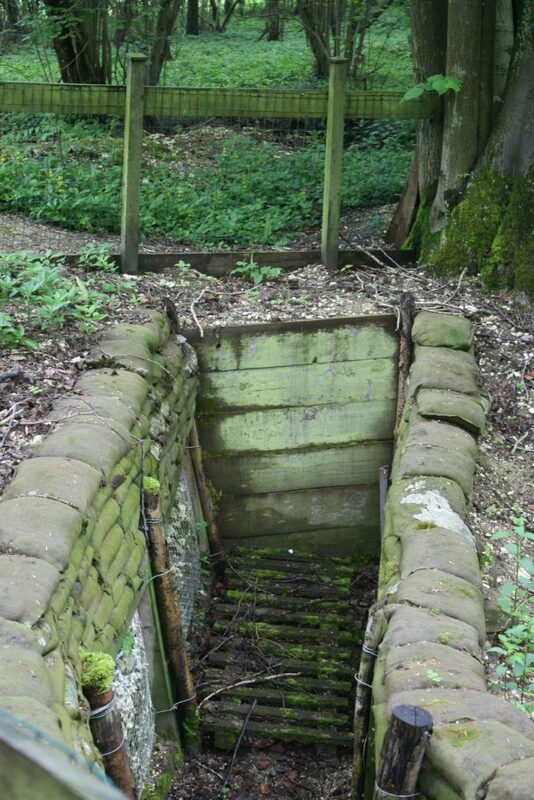 Then about five minutes afterwards I got hit in the jaw, but as soon as the machine gun went wrong, we had to pick up dead men’s rifles, as we had not time to put it right, as the Germans were getting all round us, so we had to open rapid fire. 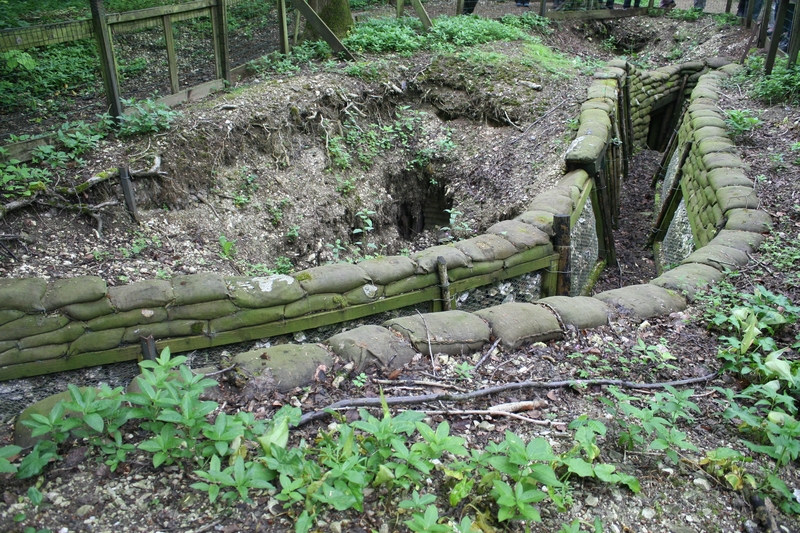 Then they got nearer, and we had a hand to-hand fight, which was not very pleasing, but it had to be done, or we should all have been wiped out.,” speaking about a charge, “over the top,” he says: “as soon as we started, the Germans shelled us, put the machine guns on us,…… and opened rapid fire….. our Corporal fell, and I dragged him into a shellhole and bandaged him up”. 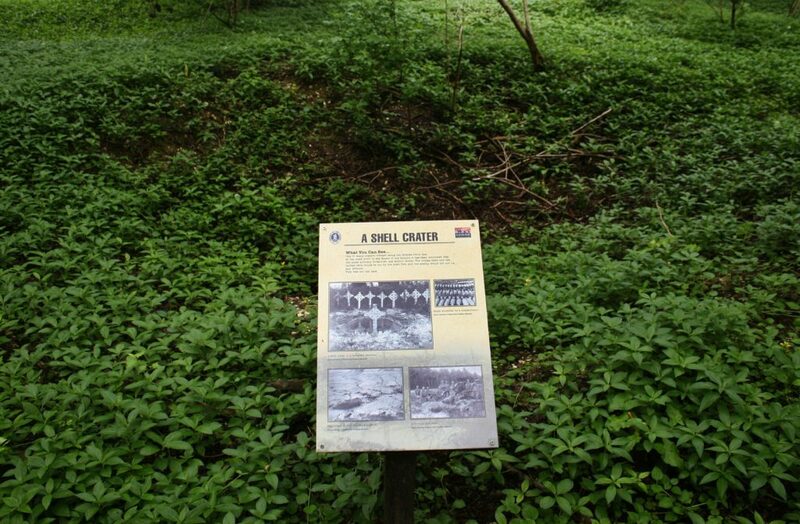 ……”in another shellhole”…he says “ a shell dropped only three feet behind me, and happened to be a ‘dud’, and it only covered us with soil. 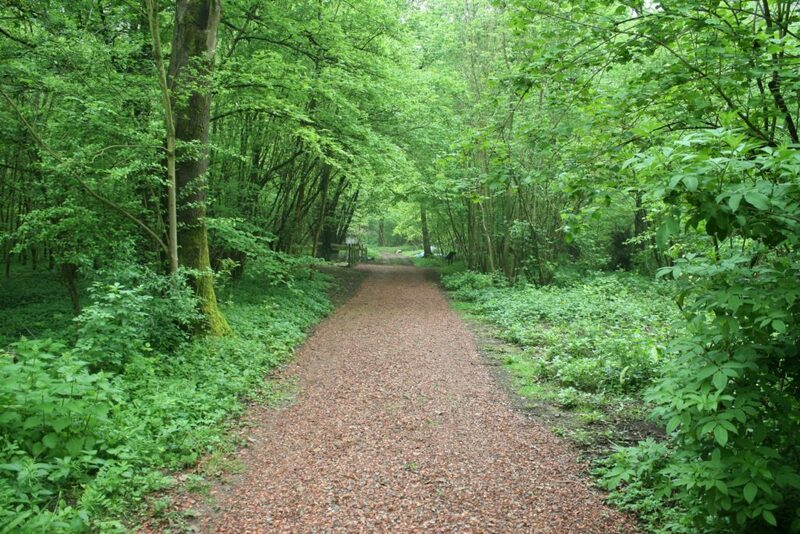 After a little while, I got with some more of our chaps, and we went on further as they had quietened down a lot, and we got to where we wanted to get. Night was getting nearer, and when it got dark, they started shelling heavily. Eight of us had to hold a strong place at all costs. We did hold it, but what a time they gave us! But we gave them more than they gave us. We were glad to see the day break, for we were tired and hungry. We had still to keep on till I got the knock-out……when I came to my senses, I had lost a lot of blood”. He also relates how it took him about three hours to get back to the dressing station. He is now getting on well in hospital. Steuart, thanks for taking the trouble to transcribe the newspaper article. Very interesting indeed. I happen to have an interest in the Queen’s & the East Surrey’s, so it made it an even better read for me. Thanks again. Just finished an English translation of Norwegian book written by Lars Mytting “The Sixteen Trees of the Somme”and then found your site…. It made it very real …Thanks heaps MagicFingers! I think that’s called karma, is it not? 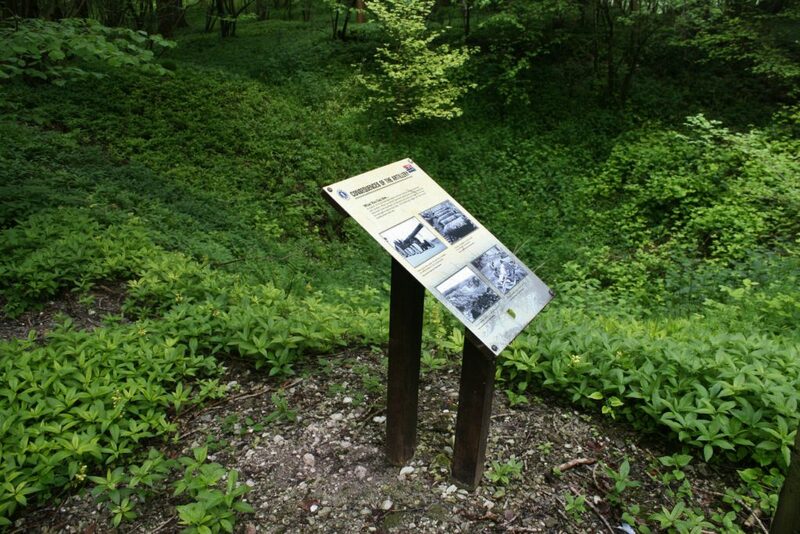 Read the book, find the site. Very cool. Thanks ever so for taking the trouble to comment, Kasia. Glad you appreciated this post. 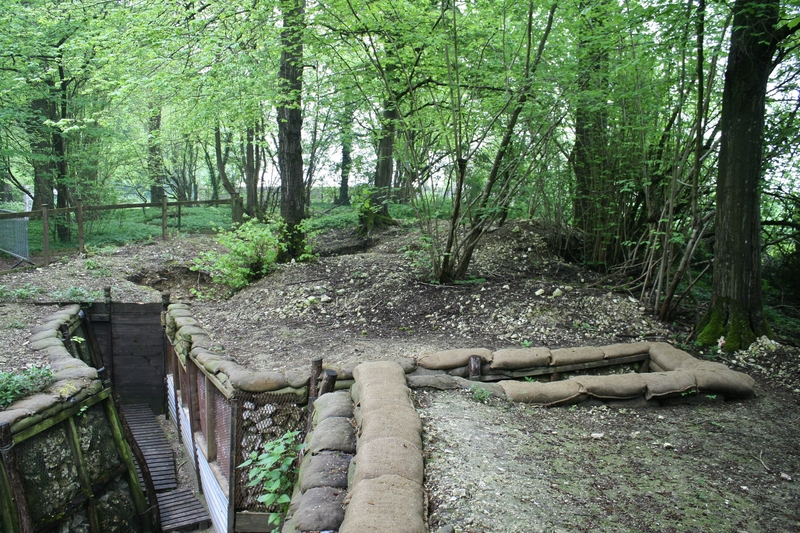 Just returned from a visit to this (and many others) site in early July 2018. 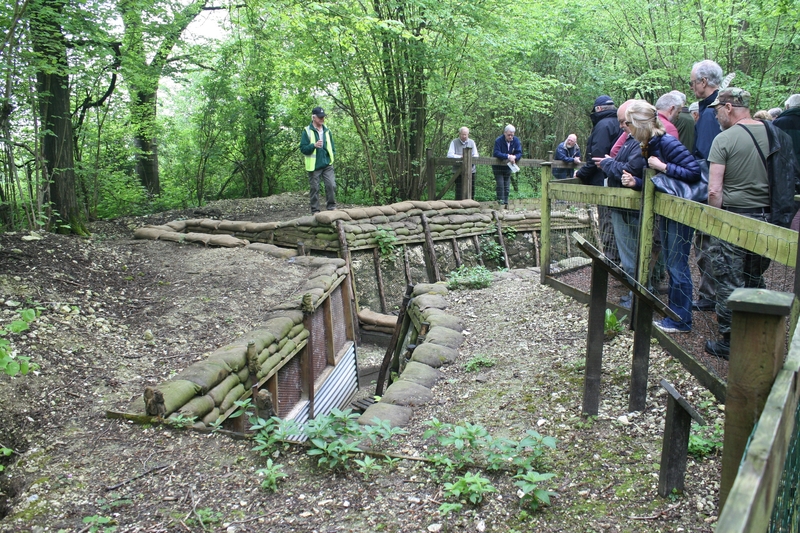 You have described the site and tour wonderfully well, a truly touching expirience for myself and others in our group. Thanks for taking the time to inform others of this terrible but truly remarkable period in our history. Thank you very much Stevie. It’s all very well sitting here in my ivory tower typing away, but it is nice to know from time to time that it’s appreciated. And I’m glad your trip was such a success. Plenty more yet to come on this site too – by the way, some one told me that Thiepval Teddy had retired? Is this true, do you know? 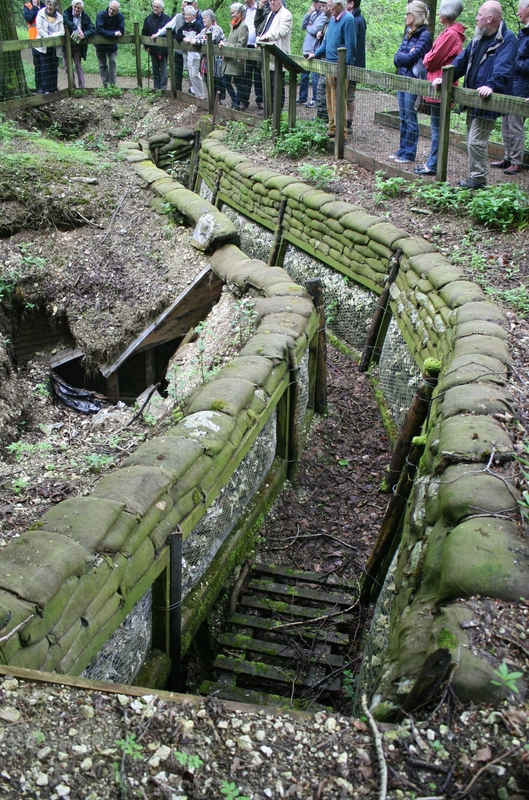 Purely by coincidence, I have just this evening published a post about another set of trenches, up near Ypres. 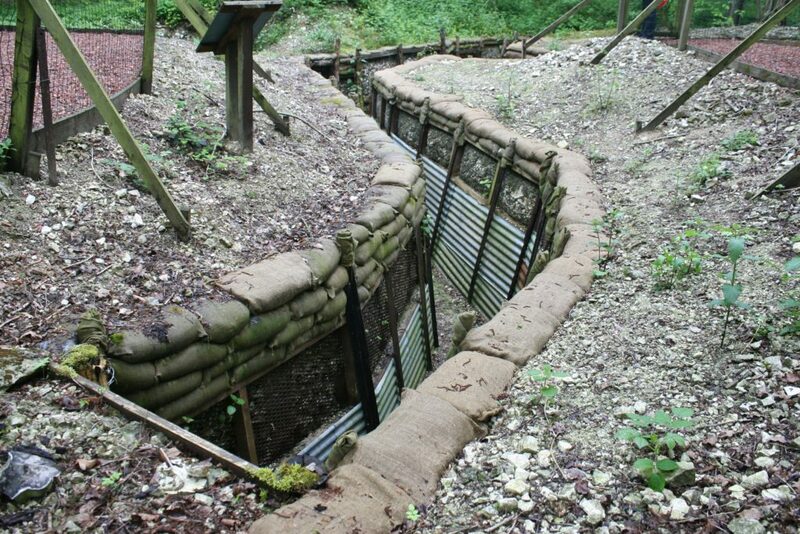 Having just discovered an read “Birdsong” by Sebastian Faulks I had to Google Thiepval. Extremely moving and I unashamedly shed tears for these unbelievably brave men who suffered and fought here and all through 1914-18 . David Sutton. HM Forces 1963-78 . David, thank you very much for your comment. And you know you are not alone. 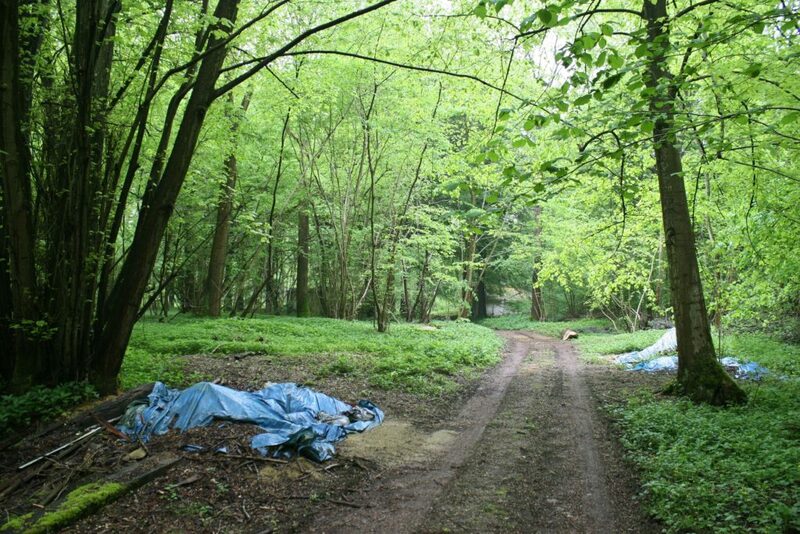 Having been researching and writing the stuff on this site for eight years or more now, there have been a few tears shed here too, I can promise you. and the links will take you through all seven. Thanks again for commenting.